At the risk of sounding like a total boozehound I must confess when I think nutmeg I immediately think cocktails: eggnog, painkillers, brandy alexanders… but being that it’s the week before Christmas and still having plenty of shopping, wrapping, and work to do, I thought it best not to make a recipe that has three different types of liquor in it – not very conducive to being highly productive. 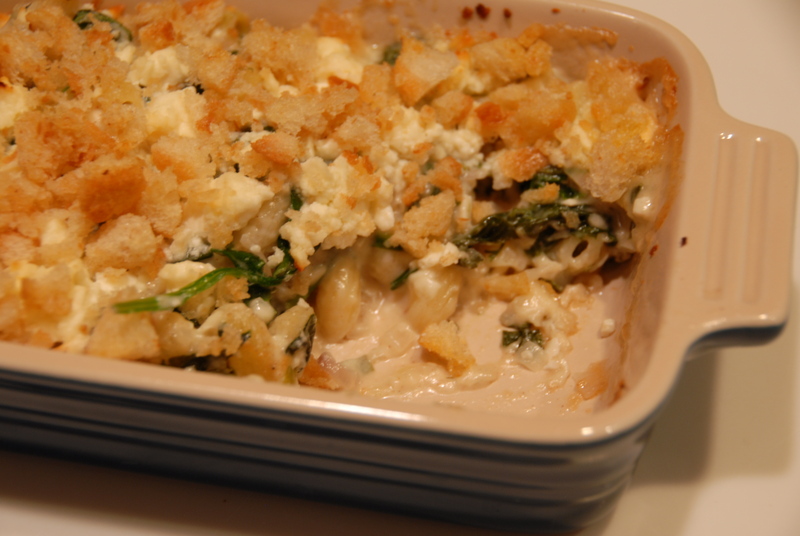 Instead, I thought a cheesy, warming casserole might be just the ticket. What better to nosh on in between running errands in a foot of snow than a bowl of mac n’ cheese? While it’s a bit more involved than boiling water and dumping in a package of orange goo this mac n’ cheese recipe is totally worth it. Based on a recipe by New York City chef Michael Psilakis – I found this gem on saveur.com. 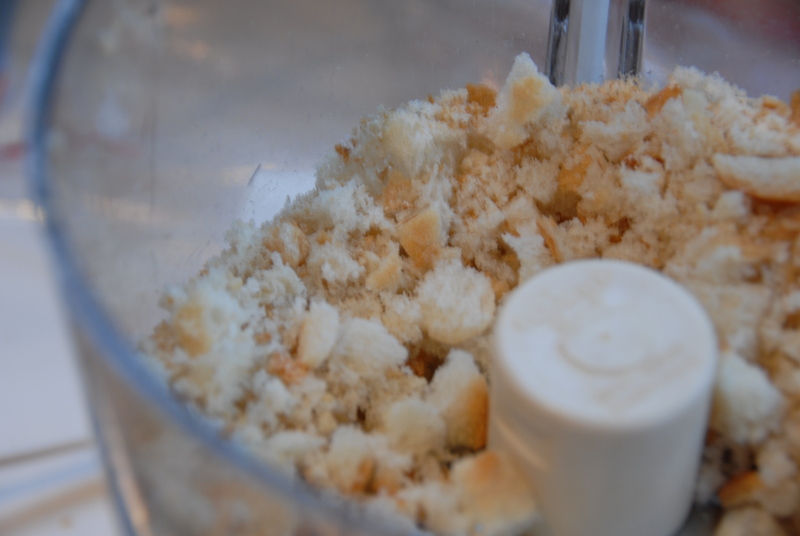 First, pop those bread pieces in a food processor and pulse until finely ground. Set the newly formed bread crumbs in a bowl with 3 tbsp. of melted butter and set aside. Meanwhile, boil a pot of salted water and cook the pasta about halfway through (the box recommended cooking for 8 minutes, I cooked it for 5 min.) Drain, rinse with cool water, and set aside. 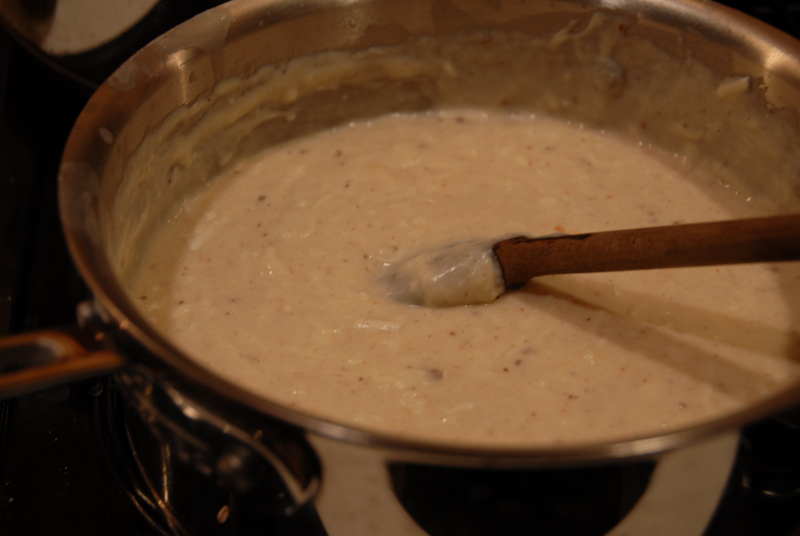 Now for the béchamel – heat the remaining butter in a 4-qt. saucepan over medium heat. Add flour and cook, whisking constantly, for about a minute. Still whisking constantly, slowly drizzle in the milk and cook until sauce has thickened and coats the back of a spoon, about 15 minutes. Remove the pan from heat and stir in Gretna, ricotta salata, cinnamon, nutmeg and season with salt and pepper and then, set aside. With the oven heating up to 350°, heat olive oil in a 5-qt. pot over medium heat. Add shallots and cook, stirring often, until soft, 3–4 minutes. Add spinach and scallions and cook, covered, stirring occasionally, until wilted, about 3 minutes. Stir in the reserved béchamel sauce, the dill, and the reserved pasta and transfer mixture to a 9″ x 13″ baking dish. Sprinkle evenly with reserved bread crumbs and the feta. Bake until golden brown and bubbly, about 30 minutes. Let cool for 10 minutes before digging in… if you can. 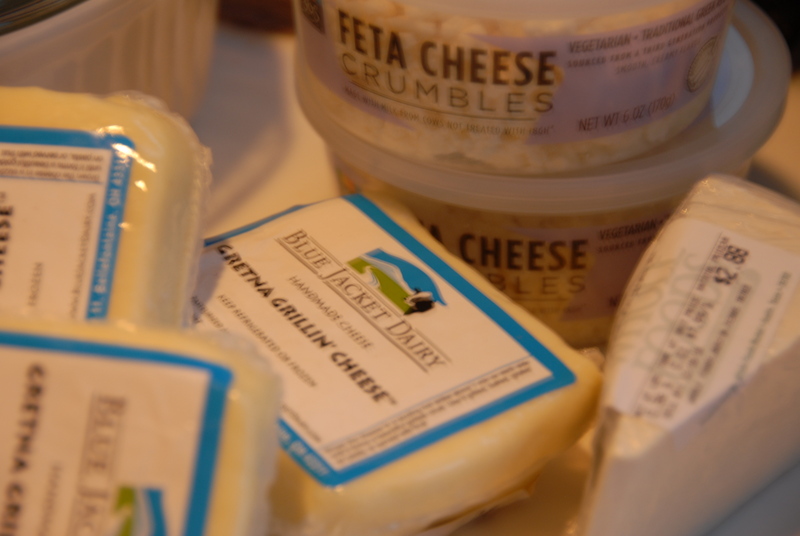 The mild cheeses really allow the fresh dill, cinnamon, and nutmeg to stand out …. mmmm….cheesy goodness. I still may make that eggnog though… after all, Christmas comes but once a year. Check out Martha Stewart’s recipe for a truly sinful nog and have a VERY MERRY CHRISTMAS! Cheers! This entry was posted in Nutmeg and tagged cheese, eggnog, feta, graviera, Greek, gretna, grilling cheese, mac n' cheese, Martha Stewart, nutmeg, spinach. Bookmark the permalink. This sounds scrumptious — making it tomorrow! Happy Christmas! So much cheesy goodness!! Excellent job Ames.